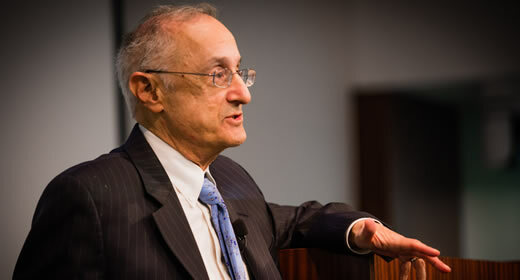 Robert Axelrod has been named the winner of the 2013 Johan Skytte Prize in Political Science. The Skytte Prize is among the most prestigious awards in political science and recognizes outstanding academics for their contribution to the discipline. According to a Skytte Foundation statement, Axelrod was chosen to receive the award for "profoundly having changed our presumptions about the preconditions for human cooperation." In his work, including the 1984 book "The Evolution of Cooperation,"
considers the conditions under which conflict gives way to cooperation. Axelrod's work has contributed to the fields of political science, economics, sociology, anthropology, biology, and computer science. As described by the Skytte Foundations, "His conclusions are decisive for improving our understanding of international relations, negotiations, complex organisations, and political decision-making bodies." The prize is awarded by the Skytte Foundation at Uppsala University in Sweden and is named for the university's 17th century vice-chancellor, Johan Skytte. The award will be presented at Uppsala University on September 28, 2013.